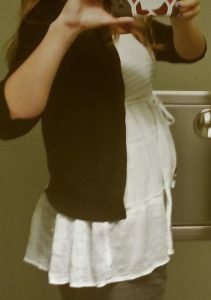 28 weeks pregnant with my surrobabe! I’m learning to gauge initial reactions. “Oh wow, that’s great! What clinic are you using?” David asked me. This is not the typical response I receive when telling someone about my surrogacy. I was talking to David, a male colleague who had somehow missed the news on what I was doing. I love his response, though! It shows 1) that he knows WHAT surrogacy is; 2) that he knows HOW AMAZING it is; 3) that I didn’t have to explain the entire thing to him. Yes! This is one of the most positive and educated responses I’ve ever received to my surrogacy. One of my biggest hurdles in surrogacy is determining WHO and HOW MUCH do I tell about the journey. Of course, everyone I see on a daily basis is aware of what I’m doing. But I don’t always want to tell the entire story with the barista, store clerk or even the ultrasound technician. I am very passionate about this experience, and will talk about it endlessly, but it is a story that requires so much background info that it can be exhausting to tell it to everyone. When strangers see my belly and say “Congratulations!” I smile, thank them, and continue on. Are you scared of getting attached to the baby? No. I am honored to grow this little girl for 9 months and then hand her back to her daddies. I cannot wait to see them meet each other! How does the embryo transfer work in surrogacy? Egg donor, sperm, months of hormone shots for me and — viola! A baby! Do you like the family you’re working with? I love them. NW Surrogacy Center did a fantastic job matching us. How much are you getting paid? You can look on the NWSC website for general surrogate compensation. What made you decide to become a surrogate? A friend opened up about her troubles conceiving and maintaining a pregnancy. I realized that I could help people in an amazing way. If the person looks pleasantly surprised, I go into full details. This is the best! My enthusiasm overflows and I hope it’s contagious. Sometimes the person immediately says, “Well, that’s nice,” and changes the topic, and I know that’s the end of the conversation and they are not fans of surrogacy. And that’s ok. To each their own. We all have special ways of contributing to the world and this is one of mine.